Hey! I just wanted to post a heads-up here that I will only be accepting commissions for Blizzcon Badges up to and including September 30th. So if you’ve been waffling or meant to contact me and didn’t, you still have a chance but the window is closing fast! I reserve the right to close commissions if I get more than I think I can reasonably complete and mail during the month of October. I want everyone to be sure to have them before they head to Blizzcon. Above is a compilation of all the badges I have done so far. They’ve been a blast to do and I really enjoy them. I kind of wanted to complete a class set – I didn’t receive commissions from any warriors, warlocks or priests. I’ll be doing a death knight painting for Voss so that’s at least one for the set! It doesn’t matter what your class is, though, I enjoy doing all of the paintings anyway. 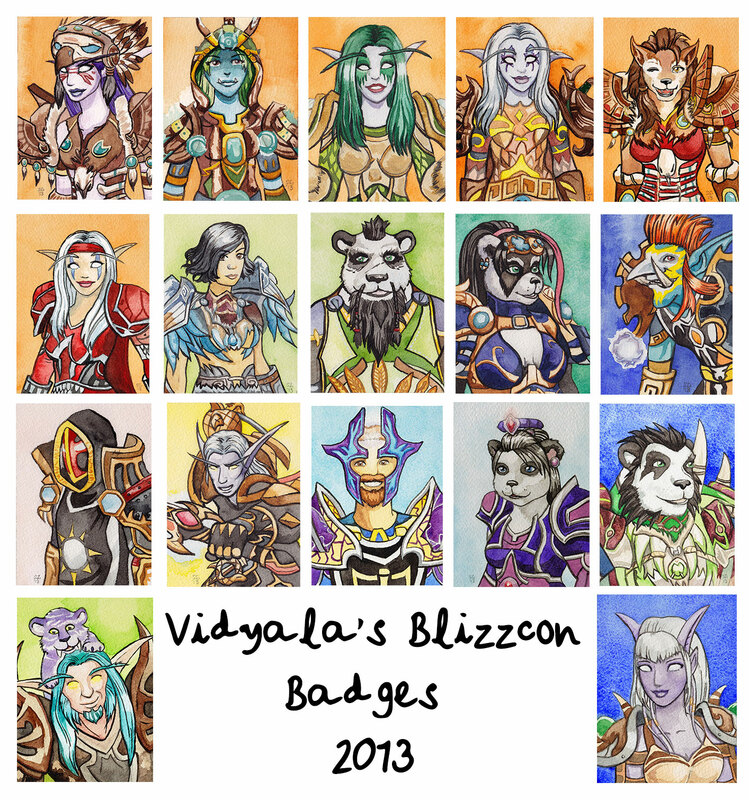 If you’re interested in a badge painting, please fill out the form on this page. Badges are $40 USD which includes shipping, a name-tag that slips into the badge holder and the holder itself. They look even better in person. Thanks to everyone who commissioned me for these, I hope you like your paintings and maybe I’ll see you at Blizzcon!